Sepsis represents a dysregulated host response to infection, the extent of which determines the severity of organ dysfunction and subsequent outcome. All trialled immunomodulatory strategies to date have resulted in either outright failure or inconsistent degrees of success. Intravenous immunoglobulin (IVIg) therapy falls into the latter category with opinion still divided as to its utility. This article provides a narrative review of the biological rationale for using IVIg in sepsis. A literature search was conducted using the PubMed database (1966 to February 2011). The strategy included the following text terms and combinations of these: IVIg, intravenous immune globulin, intravenous immunoglobulin, immunoglobulin, immunoglobulin therapy, pentaglobin, sepsis, inflammation, immune modulation, apoptosis. Preclinical and extrapolated clinical data of IVIg therapy in sepsis suggests improved bacterial clearance, inhibitory effects upon upstream mediators of the host response (for example, the nuclear factor kappa B (NF-κB) transcription factor), scavenging of downstream inflammatory mediators (for example, cytokines), direct anti-inflammatory effects mediated via Fcγ receptors, and a potential ability to attenuate lymphocyte apoptosis and thus sepsis-related immunosuppression. Characterizing the trajectory of change in immunoglobulin levels during sepsis, understanding mechanisms contributing to these changes, and undertaking IVIg dose-finding studies should be performed prior to further large-scale interventional trials to enhance the likelihood of a successful outcome. Sepsis is an inflammatory condition arising from a dysregulated host response to infection . It is clinically manifest in a highly heterogeneous manner ranging from relatively mild features of systemic inflammation through to severe sepsis and shock where organ function is significantly compromised. The extrapolated population incidence of severe sepsis from national epidemiological studies varies between 51 and 153 per 100,000 population and carries a hospital mortality of 20 to 52% . Survival rates have improved yet the overall incidence and the total number of associated hospital deaths continue to rise, in part due to increased recognition but also due to increasingly aggressive healthcare interventions in an ageing population [3, 4]. Many factors influence outcomes from sepsis, ranging from patient-intrinsic factors, such as genetic polymorphisms and co-morbidities, through to environmental factors, such as critical care resource availability . Sepsis thus remains a challenging and important condition to both diagnose and treat, especially as it carries a high risk of death, of short- and long-term morbidity, and a substantial healthcare burden . Well-established clinical and biochemical criteria are used to define sepsis and organ dysfunction , yet these fail to adequately differentiate the individual, multifaceted host response to infection and the complex interplay between neural, immune, hormonal, circulatory, coagulation, metabolic and bioenergetic systems [7, 8]. While modulating the early host response to infection to protect organ function is a well-worn concept , so is the recognition that such therapies do not address the multisystem interactions that characterize the septic process . The many clinical therapeutic failures witnessed to date relate to an over-extrapolation of findings derived from laboratory models [11, 12], and an ongoing inability to accurately delineate the host response in clinical practice and thus determine the optimal timing, dosing and duration of an intervention . An effective intervention should reduce the burden of illness associated with sepsis. This may be achieved through boosting cellular protection, enhancing the resolution of inflammation, accelerating recovery processes or, if effected early enough, by primary targeting of 'upstream' mediators (such as signalosomes and inflammasomes) that trigger the excessive activation or suppression of 'downstream' mediators and multi-system pathways such as cytokines and the complement system. Particularly with regard to the latter strategy, it is unlikely that the patient with severe sepsis will present early enough for successful therapeutic administration of a drug modulating a single upstream pathway. Far greater utility is likely to be gained through a cocktail approach, or by using agents with multiple modes of action. Prime examples of multi-modal stand-alone agents for severe sepsis and septic shock are corticosteroids and polyvalent intravenous immunoglobulins (IVIg). After a brief review of relevant sepsis biology, this article will focus upon immunoglobulins and their receptors, the potential beneficial effects of IVIg therapy in modulating the host response to infection, and an overview of the possible reasons for the limited success to date of clinical trials. The initial host response to infection involves overlapping, interlinked phases of innate pathogen and damage recognition. Microbial infection results in release of (i) pathogen-associated molecular patterns (PAMPs), that is, conserved molecular structures expressed by the microbe species, and (ii) damage-associated molecular patterns (DAMPs), that is, extracellular matrix components and intracellular constituents (for example, mitochondria, DNA, S100 proteins) released due to local tissue damage or immune cell activation . PAMPs and DAMPs are recognised as danger signals by pattern recognition receptors on the surface of immune, epithelial, endothelial and parenchymal cells. This early innate response aims to limit systemic dissemination of infection, allowing slower though immunologically more potent and focused adaptive immune pathways to develop . Infection and/or tissue damage can trigger a dysregulated and systemic inflammatory response through multi-point activation of genes transcribing for pro-inflammatory mediators and receptors. These act via inflammasomes and signalosomes - 'upstream' mediators of the host response [16, 17]. Inflammasomes are multimeric protein complexes generated in response to distress signals from PAMPs and DAMPs that act as primary initiators of the innate host response (for example, NLR-NOD proteins) [17–19]. Signalosomes are molecular complexes that mediate phosphorylation and poly-ubiquitination of inhibitory kinase complexes (for example, IκB), thereby releasing activated transcription factors that enter the nucleus and increase transcription of target genes involved in the inflammatory response. These include genes encoding downstream mediators such as cytokines, chemokines, adhesion factors, nitric oxide synthase, tissue factor and cyclo-oxygenase pathways [17, 20–22]. This complex 'downstream' response could be conceptualised as being generated and amplified from an inflammatory hub consisting of high mobility group B-1 protein (HMGB-1), complement factors, macrophage migration inhibitory factor, IL-17 and other mediators. Both upstream and downstream mediators and networks are interlinked, impairing cellular bioenergetic and metabolic function at multiple levels, and resulting in organ dysfunction [7, 23–25] (Figure 1). These changes also affect innate immune cell function, thereby impairing bacterial clearance [26, 27]. Invading pathogens have pathogen-associated molecular patterns (PAMPs) and tissue injury generates damage-associated molecular patterns (DAMPs), which are recognised by pattern recognition receptors (PRRs). Interaction of PRRs with PAMPs/DAMPs initiates the cellular activation that characterises host response in sepsis syndromes. Inflammasomes and signalosomes generated from these initiator pathways provide the feedback amplifier loops perpetuating host response. This unregulated multi-system activation involves inflammatory pathways, cytokines, coagulation, inducible nitric oxide pathways, the autonomic nervous system and the immune system. This is manifested biologically as microvascular failure, mitochondrial dysfunction and apoptotic changes - surrogates of severity of organ dysfunction in sepsis. HMGB, High mobility group box protein; iNO, inducible nitric oxide; MIF, macrophage migration inhibitory factor. The host responses described above involve concomitant activation of pro- and anti-inflammatory pathways. The balance of the host response shifts towards predominantly anti-inflammatory pathways later on in critical illness. While this results in an overall immune anergy [28, 29], some immune cell types remain hyper-responsive, underlying the complexity of the condition. Emerging literature on viral reactivation following acute pro-inflammatory critical illnesses provides further evidence that immunosuppression is a key sequela in sepsis and critical illness. This is likely related to T-cell defects, leading onto macrophage dysfunction [30, 31]. Other causes for immune anergy include (but are not limited to) enhanced regulatory T-cell activity , activation of anti-inflammatory phenotypes in inflammatory cells [28, 33], and activation of apoptotic pathways . At present, anergy is considered primarily due to lymphocyte and dendritic cell loss. Immunoglobulins (Ig) are glycoprotein molecules produced by plasma cells. B lymphocytes that are activated and propagated in a T-cell-dependent manner are the precursors of high-affinity antibody-secreting plasma cells . T-cell-independent pathways can also generate plasma cells, including those secreting naturally occurring antibodies. Each Ig molecule monomer consists of identical heavy (50 to 70 kDa) and light chain pairs (23 kDa) held together by electrostatic forces and disulphide bonds. Each heavy chain consists of amino acid sequence regions (three to four constant, one variable) that fold into globular regions called domains. Within each variable region of heavy chains and light chains there are three hypervariable or complementarity-determining regions that determine antibody specificity. The combined variable and constant regions of the heavy and light chains form the antigen-binding region on the Fab. Amino acid sequences in the remainder of the two constant regions of the heavy chains, the Fc, determine the immunoglobulin class and subclass, and therefore its functional capability. The large diversity of antigenic epitopes are recognised by the variable region of the Ig molecules. This is a function of the adaptive immune system. Binding of Ig results in many diverse antigens being signalled through a small number of Ig isotypes. Based on their heavy chain characteristic, Ig isotypes are classified into G, A, M, D and E [36, 37]. Ig mediate their immunomodulatory and predominantly anti-inflammatory effects through Fcγ receptors (FcγRs). There are six human FcγRs encoded by genes on chromosome 1, FcγRI, FcγRIIA, FcγRIIB, FcγRIIC, FcγRIIIA and FcγRIIIB . FcγRs bind to Ig and to the pentraxin family of immune mediators that includes C-reactive protein and serum amyloid P (SAP). Pentraxins activate the classical complement pathway and compete with Ig for FcγR binding, thereby activating immune cells. Pentraxin-opsonized pathogens are phagocytosed by immune cells via FcγR pathways . The distribution of receptors on immune cells and their affinity to IgG differs between FcγRs (Table 1) [38, 40–43]. FcγRs can be either activating or inhibitory depending on their inclusion or association with either the activating (immunoreceptor tyrosine-based activating motif (ITAM)) or inhibitory (ITIM) motifs in their cytoplasmic domains. Bacterial infection increases FcγR expression on innate and adaptive immune cells. FcγRI is the only high-affinity receptor that can bind to circulating monomeric IgG, while all low-affinity receptors only interact with immune complexes for signal transduction [44, 45]. FcγR, Fcγ receptor; Ig, immunoglobulin; ITAM, immunoreceptor tyrosine-based activating motif; ITIM, immunoreceptor tyrosine-based inhibitory motif; IVIg, polyvalent intravenous immunoglobulin. All FcγRs except FcγRIIB are stimulatory (that is, associated with the ITAM cytoplasmic domain) and therefore activate immune cells following IgG- or pentraxin-protein or immune complex binding. Aggregation of ITAMs results in phosphorylation of ITAM tyrosines and stimulates multiple downstream activation pathways . By contrast, FcγRIIB is associated with the ITIM cytoplasmic domain with phosphorylation of tyrosines in ITIMs resulting in attenuation of activation pathway activity . The level of FcγRIIB-related activity compared to other FcγR activity (that is, those associated with ITAM domains) plays a key role in balancing the pro- and anti-inflammatory humoral pathways in sepsis [47, 48]. It is biologically plausible that Ig modulates innate and adaptive immune effector activity essential for bacterial clearance by altering the balance between ITAM and ITIM activity via FcγRs; this equilibrium may be potentially influenced favourably with IVIg therapy . Another receptor involved in IgG pathways is the neonatal FcR (FcRn). This belongs to the family of major histocompatibility (MHC) class I molecules but is not involved in antigen presentation. Its primary roles are to maintain constant IgG and albumin concentrations and to prolong the half-life of IgG and albumin through endosome-to-cell surface recycling. FcRn-mediated pathways are important in maintaining the serum retention of native and infused IgG preparations . Other receptors for Ig molecules include the tripartite motif-containing (TRIM) protein family, some members of which appear to be particularly important in the response to viral infections . IVIg is a blood product prepared from a pool of more than 1,000 donors (frequently more than 10,000 donors), thus providing a broad spectrum of opsonic and neutralizing IgG antibodies against a variety of microbial antigens and multiple epitopes. Opsonic and neutralizing IgG antibody content varies with each product batch, primarily due to differences in the local pathogen ecology of donor exposure. IgG and complement proteins are the principal classes of opsonins contributing to bacterial clearance (amongst other opsonins such as C-reactive protein). Only one product, Pentaglobulin® (Biotest, Germany), is IgM-enriched. The principal manufacturing process in all current Ig preparations is cold ethanol fractionation with product-specific additional processes for manufacturing. The commonest processes for virus reduction include solvents/detergents, low pH (pH 4) incubation, nanofiltration and chromatography. The biological rationale for IVIg therapy in sepsis can be summarized into four main categories: (i) its role in pathogen recognition, clearance and toxin scavenging, (ii) scavenging and inhibition of 'upstream mediator' gene transcription, (iii) scavenging and inhibition of inflammatory 'downstream mediator' gene transcription, and (iv) non-apoptotic and anti-apoptotic immune cell effects. PAMPs are recognised by naturally occurring antibodies that can also act as innate immune receptors. IgG and the complement proteins are the principal opsonins for bacterial clearance. The classical pathway is activated by C1 complex interaction with Ig, acute phase proteins and various non-specific activators . The C1q molecule within the C1 complex contains a multimeric globular ligand detection domain with the ability to bind IgG and IgM Fc regions, and hence detect a large spectrum of antigens. Binding of C1q to IgG1 or IgM leads to potent activation of the classical complement pathway, thereby generating C4b2a (recently renamed as C4b2b), the classical pathway C3 convertase [50, 51]. IgG combines with C3b and this opsonisation facilitates phagocytosis . Human neutrophils express multiple cell surface Fcγ receptors that bind IgG. These receptors are constitutive (for example, FcγRIIa (CD32), FcγRIIIb (CD16) ) or inducible (FcγR1 (CD64)). IgG binding to these receptors results in neutrophil activation via tyrosine kinase pathways. Activated neutrophils upregulate expression of adhesion, chemoattractant and phagocytic receptors that identify and phagocytose pathogens opsonised with complement proteins and IgG [54–57]. Neutrophil activation and phagocytosis signals may be suboptimal in IgG-deficient patients with sepsis; this population may be an 'ideal' cohort for IVIg supplementation to augment early bacterial clearance. IVIg also contains anti-siglec-9 antibodies and their anti-idiotypes that reduce neutrophil loss in early sepsis [58–60]. Severe sepsis is associated with a decrease in circulating immunoglobulin levels [61–64]. Three-quarters of patients admitted with community-acquired pneumonia and shock had hypogammaglobulinaemia, of whom three quarters had low levels of IgG. Hypogammaglobulinaemic patients had a significantly longer duration of shock and a higher incidence of severe lung injury . Patients from the Score-Based Immunoglobulin G Therapy of patients with sepsis (SBITs) study demonstrated a wide distribution in IgG levels, although in this study low levels did not carry any prognostic significance [62, 63]. Furthermore, in a recent observational study of patients enrolled within day 1 or 2 of presentation with septic shock, 61% had IgG levels below the lower limit for age-matched reference values. This hypogammaglobulinaemia was transient and also had no prognostic significance . Superantigen exotoxins released by staphylococci and streptococci activate T cells [65, 66]. IVIg preparations contain inhibitory or neutralising IgG molecules against superantigens, and these inhibit superantigen-mediated T-cell and monocyte activation [67, 68]. In addition, IVIg preparations have also been shown to inhibit superantigen-induced cytokine production and lymphocyte proliferation, that is, independent of the presence of neutralising antibodies . Of note, toxin neutralisation is profoundly influenced not only by the antigen-binding activity of the antibodies within IVIg, but also by the Fc region of the IgG molecules, so the balance of IgG isotypes within the anti-toxin response is also critical . IVIg therapy has been shown to be beneficial in toxin-mediated bacterial diseases and shock syndromes [71, 72], although the results are inconsistent . IVIg preparations, in particular IgM-enriched preparations, contain antibodies against lipopolysaccharides of Escherichia coli, Pseudomonas aeruginosa and Klebsiella spp. .
Acquired hypogammaglobulinaemia may prevent optimal pathogen clearance and pathogen toxin scavenging, thereby perpetuating the sepsis response. As immunoglobulin levels in health vary significantly, interpretation of single-time point determinations of immunoglobulin concentration in the context of sepsis pathobiology is a key challenge. By relating the temporal profile of Ig concentrations to the trajectory and severity of sepsis, a high-risk sepsis cohort may be potentially identified for stratified IVIg intervention. However, the reasons underlying these temporal changes are currently unclear. Altered distribution due to endothelial dysfunction and capillary leak , an iatrogenic fluid resuscitation-related increase in extravascular volume with dilution of Ig [64, 75], decreased production and/or increased consumption may be implicated, as could alterations in FcRn activity resulting in impaired recycling . All the above knowledge gaps need addressing, ideally prior to further clinical trials. NF-κB dependent signalling (signalosome) is a key mechanism for generating downstream host response mediators in sepsis and other inflammatory diseases. Patients with hypogammaglobulinaemia , sepsis , and Kawasaki's disease  have NF-κB-mediated up-regulation of IL-1 and IL-1r activity. These components of the IL-1 system decrease following IVIg dosing of 0.4 g/kg, secondary to a reduction in IL-1-mediated peripheral blood mononuclear cell activation, and by induction of IL-1 receptor antagonist (IL-1ra) . The presence of neutralising antibodies in IVIg preparations may also be contributory. IVIg inhibit TNF-alpha-induced NF-κB activation on neutrophils while IgG1 blocks FcγRIIIA receptors on peripheral blood mononuclear cells, further impairing their activation . IVIg can also inhibit endothelial cell activation as demonstrated by a decrease in markers such as adhesion molecules, endothelins, pro-inflammatory cytokines (for example, IL-6) and inducible nitric oxide pathways [80, 81]. In addition, naturally occurring anti-idiotypic antibodies, auto-antibodies and immune proteins in IVIg preparations also contribute to its immunomodulatory properties . There is little direct evidence of IVIg effects on caspase signalling in sepsis. Caspases and calpain activation may contribute to myocardial dysfunction , pulmonary microvascular endothelial damage , and skeletal muscle and protein wasting in sepsis [85, 86]; thus, inhibition of these pathways may be potentially beneficial. In pemphigus, IVIg upregulated endogenous caspase and calpain inhibitors (FLIP and calpastatin, respectively) . Extrapolating this evidence will help determine whether IVIg therapy in sepsis could potentially attenuate myocardial and pulmonary dysfunction. Cytokine neutralisation is an important component of anti-inflammatory IVIg activity. Autoantibodies to cytokines such as IFN-α, -β and -γ, IL-1α, -2, -4, -6, -8, and -10, TNF-α and -β and soluble TNF receptors have all been reported in normal individuals. Thus, IVIg preparations are likely to contain such antibodies, which contribute to cytokine neutralisation [88–90]. HMGB-1 released into the circulation in sepsis syndromes is considered a key signalling molecule in the inflammatory hub concept of severe sepsis, activating cell-to-cell signalling, procoagulant activity and late phase responses . In addition, HMGB-1 is considered to have prognostic significance  and is a possible therapeutic target in sepsis syndromes and other inflammatory disorders . In septic rats, high-dose IgG pre-treatment reduced HMGB-1 activity . As IgG and IgM HMGB-1 antibodies are found in the serum samples of healthy individuals, an IVIg preparation should be able to limit HMGB-1-related activation of inflammatory and coagulation pathways . IVIg also inhibit pro-inflammatory cytokine production by bacterial superantigens or lipopolysaccharidestimulated mononuclear cells while increasing the production of IL-1 receptor antagonist, an anti-inflammatory cytokine . Cytokine-induced endothelial activation and expression of adhesion factors are key events in sepsis [17, 95]. IVIg inhibit endothelial cell proliferation and downregulate mRNA expression of adhesion molecules (for example, intercellular adhesion molecule (ICAM)-1, vascular cell adhesion molecule-1), chemokines (monocyte chemoattractant protein-1), growth factors (monocyte colony stimulating factor and granulocyte-macrophage colony stimulating factor), and pro-inflammatory cytokines (TNF-α, IL-1, and IL-6) . In addition, IVIg attenuated IL-1α-dependent leukocyte adhesion to endothelium, activation and tissue injury . The endothelial effects of IVIg are thus potentially useful in reducing the severity, or possibly preventing the onset, of new organ dysfunction in sepsis. Bacterial clearance is the primary innate immune function of the complement system. This occurs via detection of PAMPs followed by recruitment and activation of proteases. Complement pathway activation results in opsonisation of bacteria with C3b to facilitate phagocytosis, generation of membrane attack complex for bacterial cell lysis, and generation of pro-inflammatory chemokine anaphylotoxins such as C3a and C5a, which are central mediators of the inflammatory hub in sepsis [7, 50, 97–99]. Notwithstanding its desired effect on bacterial clearance, there are numerous systemic and cellular adverse effects of unregulated complement system activation. In patients with severe sepsis this may cause impaired neutrophil chemotaxis and phagocytic function secondary to down-regulation of C5a receptor type 1 (CD88) expression, leading to reduced bacterial clearance [27, 98, 100]. Complement activation can also impair cardiomyocyte function in sepsis. In an animal model this was prevented by C5a-blocking antibodies . Further-more, C5a is a key perpetuator of coagulation cascade activation , accelerated lymphocyte apoptosis, immunoparesis and autonomic nervous system dysfunction [7, 50, 98]. IVIg have complement-scavenging properties that attenuate these undesired effects of anaphylotoxins. Crucially, the anti-complement activity of IVIg does not affect bacterial clearance . The Fab2 region of the Ig molecule interacts with and scavenges C3a and C5a, thereby reducing complement-mediated cytotoxicity . Scavenging of C5a also reverses C5a-mediated up-regulation of FcγIIIa receptors and down-regulation of FcγIIb receptors. The resulting high ratio of inhibitory FcγIIb to FcγIIIa on immune activator cells such as monocytes and macrophages is responsible for IVIg-induced immunomodulation and contributes to its anti-inflammatory effects . As deregulated excessive C5a activity is likely to be a key molecular mechanism in sepsis [7, 106], C5a scavenging by IVIg therapy should improve neutrophil  and myocardial function , as well as reducing coagulopathy , immune cell apoptosis [28, 107–109] and autonomic nervous system dysfunction. Dysregulation in the nitric oxide pathway, glucose metabolism and inflammatory networks contribute to impaired neutrophil function in severe sepsis . As these represent downstream mediators scavenged by IVIg, IVIg therapy could restore neutrophil function and improve bacterial clearance. Dendritic cells act as intermediaries transducing the anti-inflammatory effects of IVIg. The DC-SIGN receptor (dendritic cell-specific ICAM3-grabbing non-integrin) acts as a major regulatory pathway . IVIg can down-regulate class II MHC expression by dendritic cells, directly inhibiting the classical CD3-T cell receptor pathway of T-cell activation . The resulting reduction in pro-inflammatory cytokine production and increasing anti-inflammatory cytokine production further contributes to the anti-inflammatory and immunomodulatory activity of IVIg . IVIg also inhibited invariant natural killer T-cell activation mediated through FcγRIIIA receptor effects . IgG can determine the CD1 expression profile of monocyte-derived dendritic cells as this is mediated, at least in part, by FCγIIA receptors. An Ig-rich milieu induced CD1d expression, whereas Ig depletion increased expression of CD1a, CD1b, and CD1c . A relative IgG deficiency in sepsis could potentially impair homeostatic T-cell regulation, with deleterious effects on host immune function [116–118]. Proliferation of activated T cells is regulated by suppressive CD4+CD25(hi) natural regulatory T cells, a pathway enhanced by IgG. In patients with common variable immunodeficiency, low dose IVIg therapy directly activated B-cell proliferation independent of T-cell signalling. This effect could be beneficial in sepsis by preventing late-onset immune anergy, potentially through reducing B cell loss . Thus, IVIg therapy in Ig-deficient patients may potentially facilitate these beneficial, lymphocyte-mediated immune responses orchestrated through dendritic cells. Activation of the extrinsic death receptor pathway and intrinsic mitochondria-endoplasmic reticulum pathways primarily result in immune cell apoptosis during sepsis [34, 120]. Initiators of apoptosis include complement proteins (C5a, via C5aR over-expression in both immune and non-immune cells) , enhanced sialic acid-binding immunoglobulin-like lectin (Siglec)-9 expression (mediating neutrophil death) , Toll-like receptor pathways (dendritic cell depletion) , the FcγRIIb pathway (lymphocyte apoptosis) , and impaired mitochondrial function. Significant B and T cell apoptosis reported in a humanised (innate and adaptive immune system) mouse model of severe sepsis has been replicated in patients with severe sepsis . Excessive apoptosis in sepsis has been shown in both circulating and lymphoid organ lymphocytes [124–126]. In addition, lymphopenia has been associated with adverse outcomes in severe sepsis, although causality has yet to be shown . Apoptotic pathways thus contribute significantly to sepsis-induced immune 'anergy' via lymphocytes and dendritic cell loss. If IVIg can attenuate immune and non-immune cell apoptosis by inhibition of extrinsic pathway activity through its ability to target upstream and downstream mediators (for example, via NF-κB and C5a inhibition), this may prevent immune anergy and maintain the significant role lymphocytes play in bacterial clearance. It may also moderate the organ dysfunction, including immune anergy [120, 128, 129]. The effects of IVIg on apoptotic pathways are inconsistent; some reports even suggest an increase in apoptosis [130, 131]. This inconsistency probably relates to IVIg preparation, composition, disease state and dose. Further studies are needed before any claims of potential benefit of IVIg therapy on immune cell apoptosis can be made. Manufacturing processes have changed significantly in the past two decades and will likely influence the pharmacodynamic and pharmacokinetic properties of the final preparations. Current processes aim to maintain the physiological balance of the four IgG subclasses, which is important for both bacterial clearance and immunomodulation in severe sepsis [132–134]. The glycosylation status of IgG in IVIg preparations can profoundly influence its anti- and pro-inflammatory effects . Studies of the degree and type of IgG glycosylation of commercial IVIg products demonstrate significant inter-product differences (S Khan, WA Sewell et al., submitted). IVIg preparations have variable pro- and anti-apoptotic properties depending on the pharmacological composition of the IVIg preparation as these have varying levels of stimulating and inhibiting antibodies to Fas and Siglec receptors [136, 137]. Which preparation is optimal may well be patient- and/or IVIg preparation-dependent. This area clearly needs further investigation. To date, 17 randomised placebo-controlled clinical trials in adult critical care patients with severe sepsis have been published, evaluating the efficacy of standard polyclonal IVIg or IgM-enriched polyclonal IVIg [63, 71, 138–152]. Meta-analyses on these trials [153–159] published to date highlight several limitations: a) non-uniform selection of study subjects due to variation in disease definition (severe sepsis); b) the intervention itself (for example, relationship of timing of the intervention to illness trajectory, lack of use of biomarkers to stratify intervention and to target likely responders, no pharmacokinetic profiling of the intervention, and an inability to achieve a definition for the adequacy of dosing); and c) shortcomings in trial design (for example, single-centre underpowered studies with limited external validity, intervention bias from lack of blinding of the control arm) [62, 111, 137–150]. The heterogeneity in sepsis definitions used for trial inclusion [9, 10, 13], and in interventions (dose, timing, placebo intervention) is highlighted in Table 2. 1. At least 4 out of 9 components of sepsis criteria: temperature >38.5°C or <36°C; white blood cell count >12 × 109 l-1 or < 3.5 × 109 l-1; heart rate >100 minute-1; respiratory rate >28 minute-1 or fraction of inspired oxygen (FiO2) >0.21; mean arterial pressure <75 mmHg; cardiac index >4.5 l minute-1 m-2 or systemic vascular resistance <800 dyn s cm-5; platelet count <100 × 109 l-1; positive blood cultures; clinical evidence of sepsis (surgical or invasive procedure during the preceding 48 h or presence of an obvious septic focus). ACCP, American College of Chest Physicians; APACHE, Acute Physiology and Chronic Health Evaluation; HAS, Human Albumin solution; IVIg, polyvalent intravenous immunoglobulin; SCCM, Society of Critical Care Medicine; SIRS, systemic inflammatory response syndrome. No less than seven recent systematic reviews and meta-analyses have summarized these interventional trials yet have yielded conflicting results [153–159]. IVIg therapy is reported by most meta-analyses to be associated with an overall survival benefit when compared with placebo or no intervention in adult patients with severe sepsis. Two meta-analyses [155, 158] separately estimated treatment effects for IVIg and IVIgAM and found a strong treatment effect for IgM-enriched IVIg (risk ratio (RR) = 0.66; 95% confidence interval (CI) 0.51 to 0.85.) and a borderline significant effect for IVIg (RR = 0.81; 95% CI 0.70 to 0.93) . When analyses were restricted to studies at low risk of bias, neither IVIg nor IgM-enriched IVIg showed significant benefit at the 5% level (RR = 0.97; 95% CI 0.81 to 1.15; 5 trials, n = 945) . Likewise, the metaanalyses restricted to 'high quality' trials report non-significant results with IVIg treatment [154, 156, 158]. The reasons for heterogeneity in treatment effects include dosage regimen, duration of therapy, trial quality, publication date and whether patients had septic shock or other forms of severe sepsis . In seven studies (560 patients) that used either a total dose ≥1 g IVIg per kilogram body weight (RR = 0.61; 95% CI 0.40 to 0.94]), or provided IVIg therapy for ≥2 days (17 trials, n = 1,847, RR = 0.66; 95% CI 0.53 to 0.82) there was a strong association with survival benefit . It should also be stressed that IVIg therapy is not without side effects. Common complications reported include thromboembolic events, renal dysfunction, aseptic meningoencephalitis, and anaphylaxis or anaphylactoid reactions. IVIg are often dispensed as a 5% solution; the effects of inappropriate volume loading in critically ill patients could be detrimental. In addition, subclinical sepsis can be associated with IVIg infusion reactions in patients with antibody deficiency . Observational research is necessary (i) to characterize changes in Ig concentrations during the septic process and (ii) to delineate mechanisms contributing to any impact on outcome parameters (for example, duration, progression and severity of organ dysfunction, new organ dysfunctions during critical care stay, and fatality). From the literature review presented, we feel the pleotropic effects of IVIg on the sepsis-induced host response are likely to be secondary to both suppression of synthesis and direct scavenging of upstream and downstream mediators of the host response, and complex yet unclarified immunomodulatory effects mediated via Fcγ receptors. These mechanisms require confirmation with well-conducted pharmacodynamic studies to provide the rationale for use of a specified dose and duration. Whether plasma Ig levels, or another variable, can be a useful theragnostic marker for identifying and optimally treating a septic cohort also requires delineation. Pharmacokinetic studies of IVIg in sepsis are yet to be performed, and this is an important omission. Data for dosage selection in current practice are principally derived from studies in volunteers and in patients with primary immune deficiencies and other indications for immunomodulation . In severe sepsis, potential confounders include systemic inflammation with fluctuations in immune function, increased vascular permeability, massive trans-compartmental fluid shifts and endothelial dysfunction. Existing pharmacokinetic studies  also do not address Ig clearance nor the serum Ig concentration to which dosing was targeted for modelling dosing calculations in sepsis. Such observational studies will crucially underpin the design of an explanatory interventional trial by informing the hypothesis for justifying an IVIg intervention, that is, replacement of low Ig concentration to physiological levels versus immunomodulation. The dosing and frequency of IVIg administration may differ significantly depending on the underlying scientific rationale. A theragnostic marker(s) may identify a high-risk cohort and there may be a predefined value for an IgG cutoff. This explanatory trial should ideally precede any large, multicentre, interventional trial testing the efficacy of IVIg in a well-defined critically ill population with sepsis. 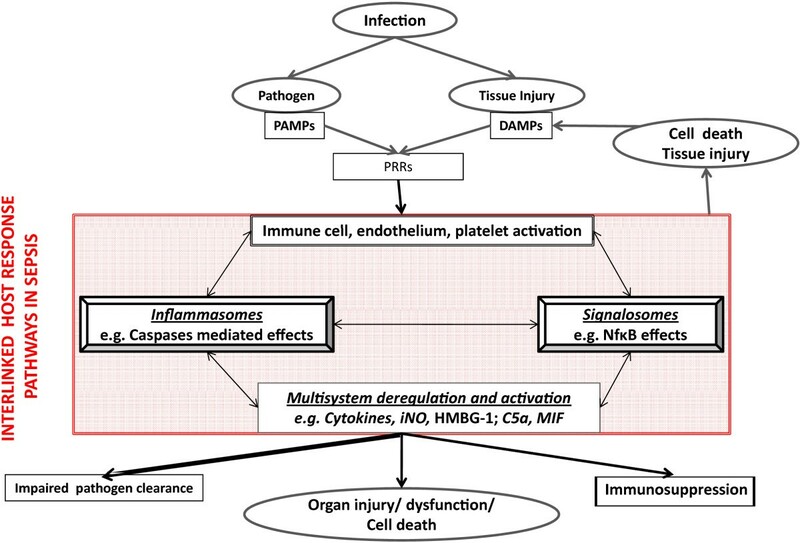 Severe sepsis results in persistent excessive stimulation of multiple pro-inflammatory cellular pathways leading to host tissue damage, amplification and dysregulation of the immune response through further stimulation of the pattern recognition receptors. This destructive and self-amplifying response to infection is accompanied by a fall in serum Ig concentrations through mechanisms as yet unknown. Ig have many beneficial effects, either as natural, innate Ig or by inducing specific antibody through the adaptive immune response. It is logical to predict that replacement of serum Ig through infusion of IVIg would restore important Ig functions as described above. The failure to date to show benefit may be a consequence of the di culty in providing meaningful data and the differences in preparations used. Stringently controlled studies are required, ideally against direct indicators of the patient's immune status. None of the authors received any funding with respect to this work.